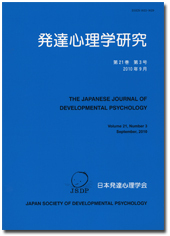 The Japanese Journal of Developmental Psychology (JJDP) is the official journal of the Japan Society of Developmental Psychology (JSDP), and is published quarterly. It currently has a readership of approximately 4,000 subscribers. The JJDP contributes to the advancement of the developmental sciences by publishing a variety of high quality research articles, from the fields of developmental psychology and numerous related disciplines. Research published in the JJDP consists of original manuscripts only. This research is wide-ranging and includes empirical reports based on statistical analyses, literature reviews, theoretical discussions, case studies, etc. Among its four issues each year, the JJDP occasionally publishes special issues on important selected themes. The JJDP is a Japanese-language journal, and includes English-language abstracts of all research report articles. The two classifications of articles in the JJDP are empirical research articles and opinion papers.